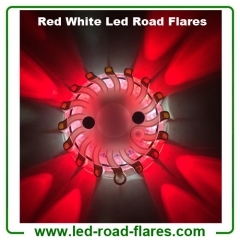 Rechargeable Led Road Flares features smokeless, flameless, non-toxic, crushproof and waterproof. It is used for traffic control, accident scenes, vehicle breakdown, hazard marker, tactical military operations, helicopter landing zones, natural disasters, marine uses to identify road hazards, signal for help, mark detours, underwater scuba or repair applications and for police, fire, military, construction, aviation marshaling and taxiing. Led Road Flares are widely used as a warning light or emergency beacon in traffic safety, road emergency and disaster rescue survival kit. Led Road Flares is with 16 super bright LEDs that are made of TPE/PC and is waterproof in any emergency situation in any weather conditions and perfect for bringing attention to any accident at night and/or in bad weather. 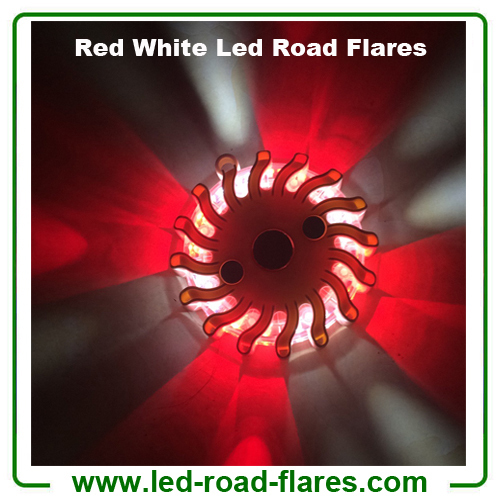 The Led road flares are with 9 kinds of flash functions. 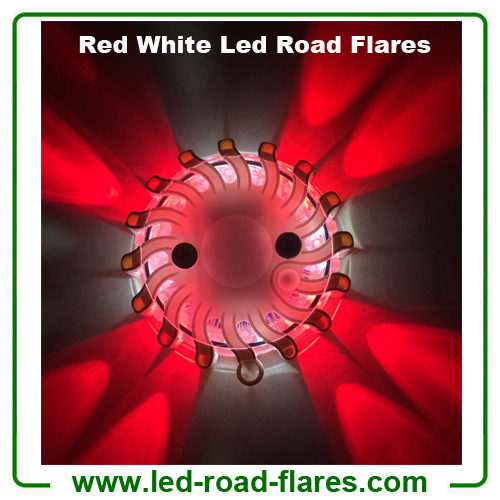 Led road flares are of simplest possible light strobes, which come in the market in laced forms with about 3 Watt of Led lights and in varieties of lighting colors like red/blue/green/yellow /amber/orange/white Led and red/blue/green/yellow/orange/amber/white/black housing. Normally, Led Road Flares with red/blue/green/white/yellow/amber/oange single light. But Duo Colors Led Road Flares are need in some situations. 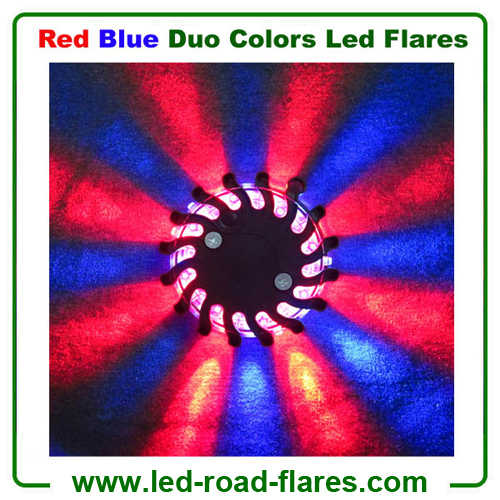 We provide customized duo colors led road flares like Red Blue Led Road Flares, Red Yellow Led Road Flares, Amber White Led Road Flares, Red White Led Road Flares, Red Green Led Road Flares. 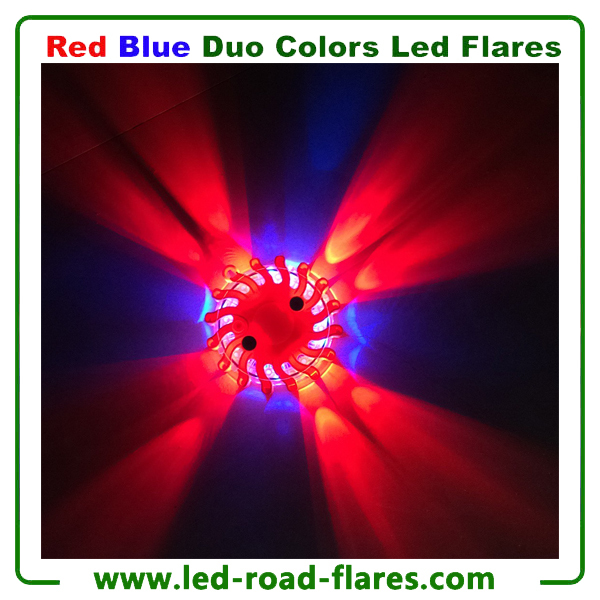 In addition, we make other duo colors led road flares based on different requirements. Fire and rescue departments, Road closures, Highway Maintenance crews, Personal Safety beacon, Vehicle Recovery services, personal vehicles, commercial vehicles, RVs, boats,road hazards, signal for help, mark detours, underwater scuba or repair applications and emergency responders.